Plum City – (AbelDanger.net): United States Marine Field McConnell has linked HSBC, Serco’s bank and small-business funder of Base One Technologies’ honey-pots allegedly used by Hillary Clinton since 1994, to the Black Hand* navigators’ alleged ‘spoof’ of the State Department authority which put the USS Cole into a dockside ambush in Aden Harbour on 10/12/2000. Black Hand* – HSBC’s drug-hub navigators with a Serco “License to Track, Film and Kill” for the City of London’s Honourable Artillery Company 1537; The Master Mariners and Air Pilots (formerly GAPAN) 1929, and The Ancient and Honorable Artillery Company of Massachusetts 1638 – whose alumni include the United States’ Presidents James Monroe, Chester Alan Arthur, Calvin Coolidge and John F. Kennedy and – perhaps – Barack ‘Choom Gang’ Obama. McConnell claims that Serco/Base One set up the Clinton honeypot for the dockside ambush of the Cole with the help of Citigroup director John Deutch, who, two days after his resignation as director of the CIA on December 15, 1996, was found to have thousands of pages of classified documents on unsecured (CIA) Macintosh computers at his home (Hello Hillary!). McConnell notes that by Fall 2000, John Deutch was the target of a criminal investigation by Clinton Attorney general Janet Reno, only to be pardoned by President Clinton on his last day in office on January 20, 2001, leaving America vulnerable to a Base One Honeypot 9/11. 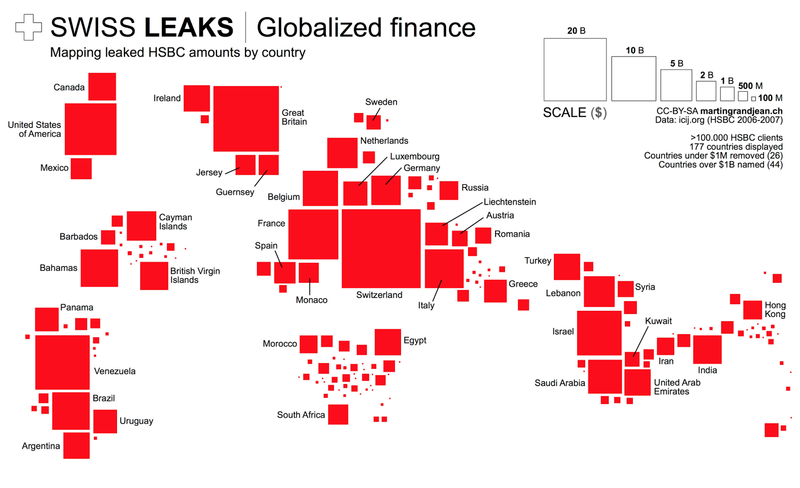 McConnell claims that HSBC used SBA loans to finance the Serco/Base One Clinton honeypot for the ambush of the Cole and paid Black Hand navigators to ‘spoof’ then-Secretary of State Madeleine Albright and trick the USS Cole‘s Commander Kirk Lippold into believing he had local diplomatic clearance from the Yemen to dock in Aden harbor for a routine fuel stop. “Mr. SAXTON. Can you tell us is there communication between the Department of Defense or the folks that are making decisions in the Navy about these things and the State Department relative to diplomatic issues involving ports or countries such as Yemen? General FRANKS. Yes, sir there is. And both in terms of an operational capability as well as in an intelligence capability. For example, the fact that we are seeing issues in the Middle East which we are continuing to see on the TV today, the Cole certainly was in possession of all of that information as well as the intelligence information. Mr. SAXTON. When you decide whether to use a port for refueling purposes, is there consultation with the State Department? General FRANKS. Sir, there certainly is. As a matter of fact, the State Department at the local level has to get the diplomatic clearance from the country where the port visit will be conducted. Mr. SAXTON. I wanted to pursue that. Because when you answered earlier that the decision was made, I got solely for operational purposes. There is communication and consultation between the folks that make those decisions and DOD and the State Department? General FRANKS. Yes, sir, at this level. But once, sir, as it gets down to the operating level, where those naval commanders are, and as you know, our naval commander is in Bahrain. 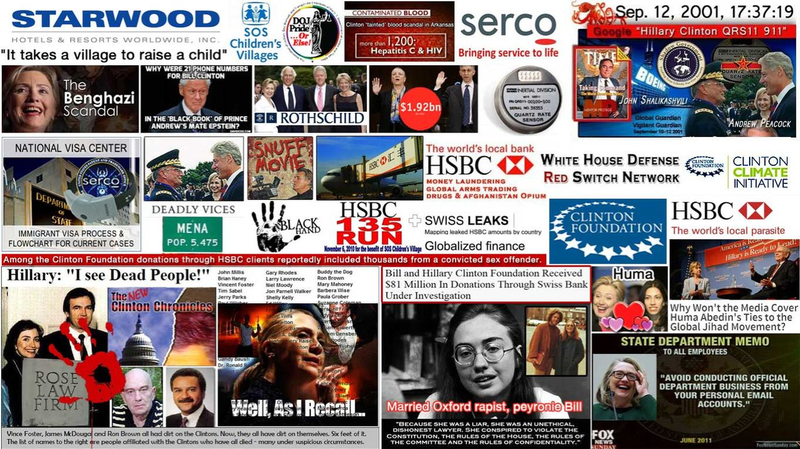 McConnell believes that HSBC officers have been funding Serco/Base One honey-pots for Hillary Clinton since 1994 and hired Black Hand navigators to ‘spoof’ the State Department authority which put the USS Cole into a dockside ambush in Aden Harbour on 10/12/2000. Hillary Clinton didn’t take a basic precaution with her personal e-mail system to prevent hackers from impersonating or “spoofing” her identity in messages to close associates, according to former U.S. officials familiar with her e-mail system and other cyber-security experts. Experts told us that oversight was just one flaw of a security system that would have been relatively easy for foreign intelligence services and others to exploit. “I have no doubt in my mind that this thing was penetrated by multiple foreign powers, to assume otherwise is to put blinders on,” said Bob Gourley, the chief technology officer at the Defense Intelligence Agency from 2005 to 2008 and the founder of Cognitio, a cybersecurity consultancy. Spoofing a senior official’s e-mail identity is also an easy way to conduct “spear phishing” attacks, where an attacker sends a personally crafted e-mail that appears to come from a trusted source. Once the target opens it, his own system can be compromised. Clinton said she e-mailed with dozens of State Department and White House officials using her server, including President Barack Obama. There’s no evidence that Clinton’s e-mail server was linked to those or any other specific attacks. And it’s worth noting that the State Department’s e-mail domain does not have SPF enabled. Thus, experts point out, it may also have been vulnerable to hacking during her time as secretary. The problem with such confidence is that if hackers exploited the SPF vulnerability, Clinton’s office would likely never have known her domain name, which has been public information since March of 2013, was being used surreptitiously. Merrill declined to say who has been in charge of maintaining the server or ensuring its security since 2009 [Base One Technologies, mentored by Serco]. This would be a good question to have answered. It would be important to know, for instance, what sort of security vetting the employees overseeing the server received. It would be useful to know, too, if the federal agencies that protect sensitive government communications — the FBI and the NSA — were aware of the server’s existence and helped to provide security. Clinton has refused to clarify this issue, saying only that the server “had numerous safeguards and was on property guarded by the Secret Service In 2008. Chinese hackers penetrated the e-mail systems of both the Barack Obama and John McCain campaigns, which were operating on commercial systems. After the hacks were discovered, the FBI lent its assistance and the hacks stopped. Until team Clinton answers vital questions about exactly what safeguards were in place in Chappaqua, New York, we won’t know how likely it was that sensitive communications at the highest level of government may have ended up in unfriendly hands. 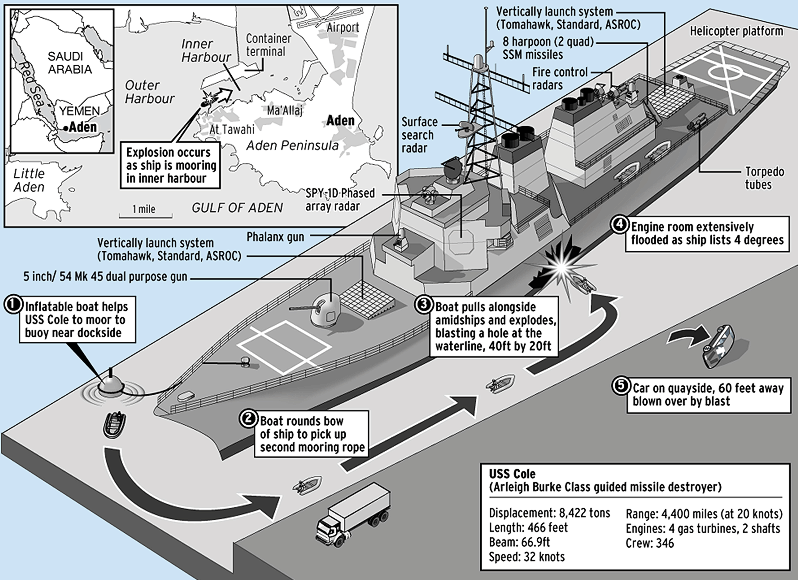 “The USS Cole bombing was a suicide attack against the United States Navy guided-missile destroyer USS Cole (DDG-67) on 12 October 2000, while it was harbored and being refueled in the Yemeni port of Aden. 17 American sailors were killed, and 39 were injured. This event was the deadliest attack against a United States Naval vessel since 1987. On the morning of Thursday, 12 October 2000, USS Cole, under the command of Commander Kirk Lippold, docked in Aden harbor for a routine fuel stop. Colecompleted mooring at 09:30; refueling started at 10:30. Around 11:18 local time (08:18 UTC), a small craft approached the port side of the destroyer, and an explosion occurred afterward, creating a 40-by-60-foot gash in the ship’s port side, according to the memorial plate to those who lost their lives. Former CIA intelligence officer Robert Finke said the blast appeared to be caused by explosives molded into a shaped charge against the hull of the boat. Around 400 to 700 pounds (200–300 kg) of explosive were used. The blast hit the ship’s galley, where crew were lining up for lunch. The crew fought flooding in the engineering spaces and had the damage under control after three days. Divers inspected the hull and determined that the keelwas not damaged. 17 sailors were killed and 39 were injured in the blast. The injured were taken to the United States Army’s Landstuhl Regional Medical Center near Ramstein, Germany, before being sent to the United States. The attack was the deadliest against a U.S. naval vessel since the Iraqi attack on the USS Stark on 17 May 1987. Theasymmetric warfare attack was organized and directed by the terrorist organization al-Qaeda. In June 2001, an al-Qaeda recruitment video featuring Osama bin Laden boasted about the attack and encouraged similar attacks. The NVC houses more than 2.6 million immigrant visa files, receives almost two million pieces of mail per year and received more than half a million petitions from the U.S. Citizenship and Immigration Service (USCIS) in 2011. Its file rooms‘ high-density shelves are stacked floor-to-ceiling with files, each a collection of someone’s hopes and dreams and each requiring proper handling. … Strategy Review: Serco’s future to be as an international B2G business. A successful, innovative and market-leading provider of services to Governments. Core sectors: Justice & Immigration, Defence, Transport, Citizen Services and Healthcare. One of these skeletons is Nora Slatkin. Having risen to a post as Assistant Secretary of the Navy for Acquisition in 1995 she resigned and was immediately appointed as the Executive Director of the Central Intelligence Agency. The Executive Director is the number three position at Langley and is responsible for all Agency operations. Her boss was then Director of Central Intelligence (DCI) and current Citigroup Board Member John Deutch. The timeline – as compiled from stories in The New York Times, The Washington Post and AP and the CIA’s web site – around her tenure at CIA and of her transition to Citigroup is most revealing. May 10, 1995 – John Deutch sworn in as DCI. May 19, 1995 – The Senate announces that Nora Slatkin is leaving the Department of Defense (Assistant Secretary of the Navy) to join the CIA as Executive Director. December 15, 1996 – Deutch resigns as DCI. December 17, 1996 – A CIA computer security official visits Deutch’s home and discovers thousands of pages of classified documents on unsecured (CIA) Macintosh computers. Almost immediately the CIA General Counsel, Tom O’Neil and Nora Slatkin are advised of the breach. 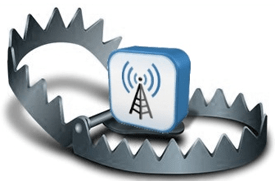 Slatkin advises DCI Tenet. December, 1996 – Deutch joins the Board at Citigroup. Dec 20, 1996 – Deutch begins deleting files from his computers. January, 1997 – CIA security officials complain to Slatkin that O’Neil is dragging his feet. Slatkin takes no action in response, except to “hold discussions.” Deutch refuses to be interviewed by security staff. Summer, 1997 – The CIA security staff completes a report on Deutch which languishes in the security office awaiting action. Fall, 1997 – Claiming ignorance of the security office’s investigation, DCI Tenet grants Deutch new security clearances. October, 1997 – On Deutch’s recommendation Slatkin also joins the Board at Citigroup. Her current title – Senior Manger of Government Relations. March, 1998 – After seven years of service, CIA Inspector General Frederick P. Hitz retires to assume the Goldman Sachs Chair on International Intelligence at Princeton University. He later tells The New York Times that he assumed that his successor, Britt Snider, would advise the Department of Justice as to Deutch’s possible criminal mishandling of CIA records. Oops! April, 1999 – Janet Reno’s Justice Department declines to prosecute Deutch while nuclear scientist Wen Ho Lee languishes in jail for similar violations. February, 2000 – After a CIA Inspector General’s report on Deutch’s conduct leaks to the press Janet Reno reopens the investigation. Prosecutor Paul Coffey recommends criminal charges. March, 2000 – Slatkin and Hitz contradict Tenet and state that he was much more involved than previously admitted. Summer/Fall 2000 – The criminal investigation of Deutch inches ahead in secret. Fears mount that John Ashcroft, as Bush Attorney general, will aggressively pursue criminal charges. 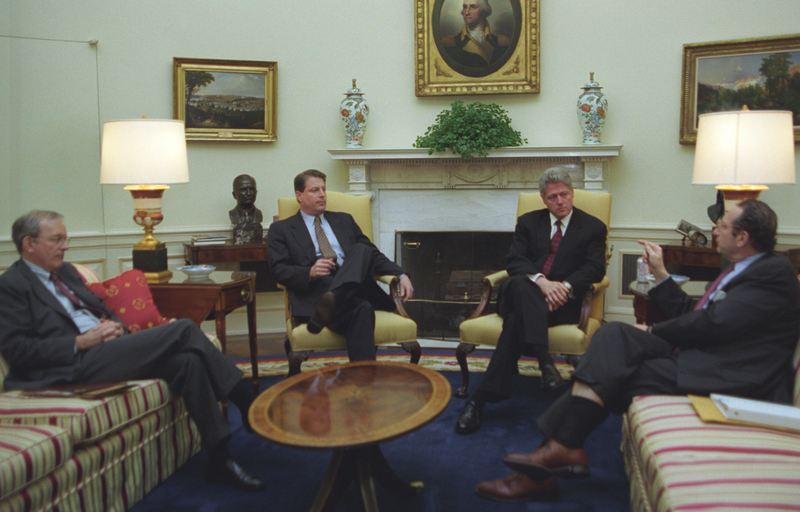 January 20, 2001 – On his last day in office President Clinton pardons Citibank Director John Deutch. Given the enormity of documentation on Citibank’s direct involvement with drug and criminal money laundering and the extraordinarily detailed investigations by journalist Al Giordano at www.narconews.com, several questions become obvious. Giordano’s translation of Spanish language reports on the on again, off again relationship between Citibank and Peruvian CIA backed strongman Vladimiro Montesinos, suggest that CIA tells Citibank which criminal clients are acceptable for Private Banking money laundering activities. Clearly, the timeline implies that Slatkin’s hiring at Citibank was a quid pro quo for her services in stalling the Deutch investigation. But more so it raises the question as to whether Slatkin is the CIA liaison at Citigroup to open approved channels for money laundering. Also, it must be asked whether or not there is a partisan flavor to Citigroup’s activities. All of the players here were Democratic Party apparatchiks. Is the Democratic Party the sole beneficiary of Citigroup criminal money laundering? Much will be revealed when the Bush Administration weighs in on the Banamex acquisition.